Centennial means a hundred year old or more as defined in Webster's dictionary — and if you keep this in mind when looking through this ebook, you ill note that beauty lasts forever! 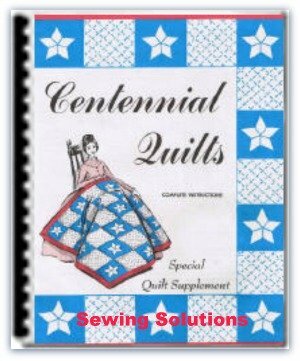 Quilt makers created the seven designs shown in this history of quilt blocks ebook, to record the important events that were taking place in the middle 19th century from coast to coast in our Country. These designs are just as lovely in today's bedroom as they were in yesteryear's. 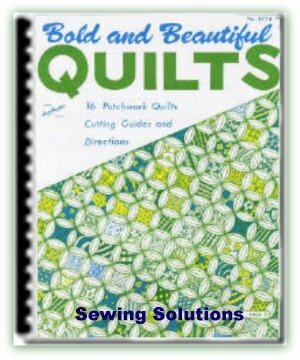 So take your scissors and needle in hand, and start making a quilt if you use the colors suggested in the directions to create the authenic aged look. 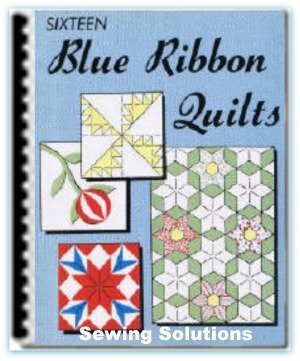 Or those color combinations, that will complement and add to the decor of the room in which the quilt will be used. 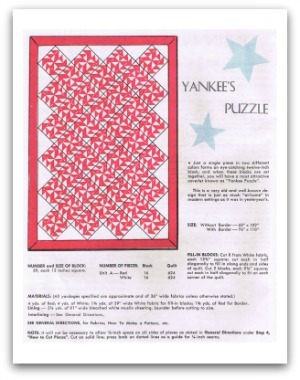 Just a single piece in two different colors forms an eye-catching twelve-inch block; and when these blocks are set together, you will have a most attractive coverlet known as "Yankee Puzzle". This is a very old and well known design that is just as much "at home" in modern settings as it was in yesteryear's. 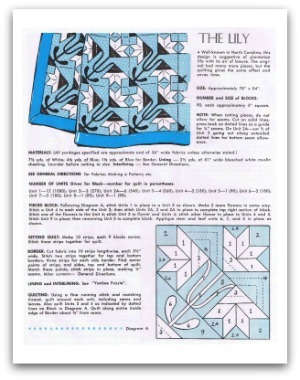 “The Lily” Well-known in North Carolina, this design is suggestive of plantation life with its air of leisure. 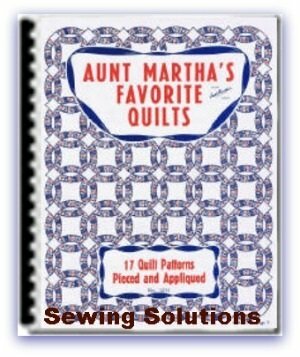 The original had many more pieces, but the quilting gives the same effect and saves time. 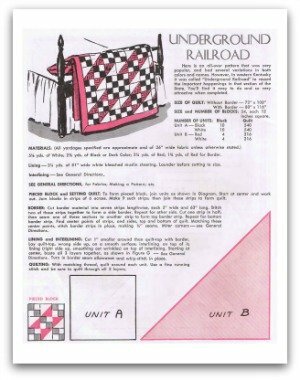 “The Underground Railroad” is a creative history of quilt blocks. Here is an all over pattern that was very popular, and had several variations in both colors and names. However, in western Kentucky it was called "Underground Railroad" to record the important happenings in that section of the State. You will find it easy to do and so very attractive when completed. A variation of the "saw-tooth" patchwork, this lovely quilt was made for a bride-to-be and named "Union Square" because at that time there was a great deal of excited talk about Mr. Lincoln and the saving of the Union. 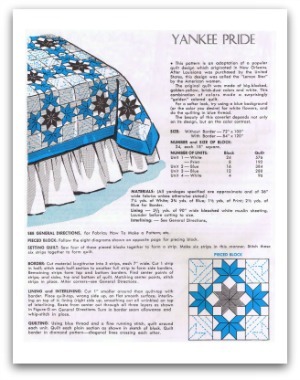 “Yankee Pride” This pattern is an adaptation of a popular quilt design which originated in New Orleans. 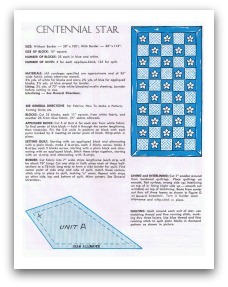 After Louisiana was purchased by the United States, this design was called the "Lemon Star" by the American women. The original quilt was made of big blocked, golden yellow, brick dust colors and white. This combination of colors made a surprisingly "golden" colored quilt. 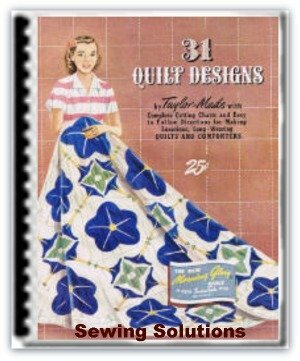 For a softer look, try using a blue background (or the color you desire) for white flowers, and do the quilting in blue thread. The beauty of this coverlet depends not only on its design, but on the color contrast. 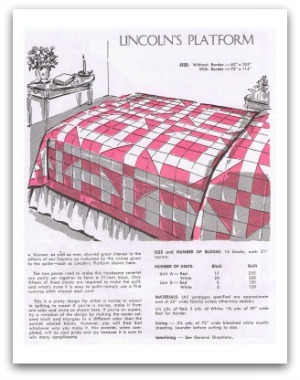 “Lincoln's Platform” Women, as well as men, showed great interest in the affairs of our Country as indicated by the names given to the quilts such as Lincoln's Platform shown here. The two pieces used to make this handsome coverlet are easily set together to form a 21-inch block. 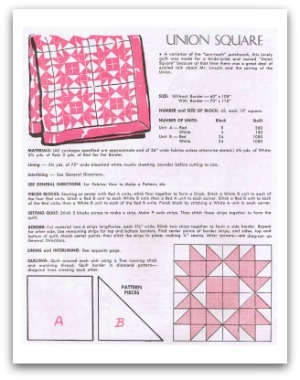 Only fifteen of these blocks are required to make the quilt, and what's more it is easy to quilt. 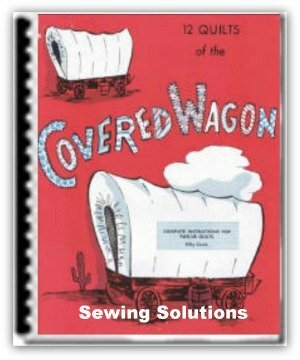 Simply use a fine running stitch around each unit! 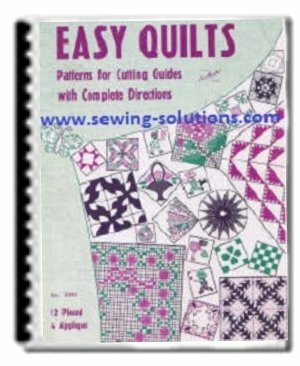 This is a pretty design for either a novice or expert in quilting to make! If you're a novice, make it from one color and white as shown here. If you're an expert, try a variation of the design by making the center colored block and triangles in a different color than the outside colored blocks. However, you will find that whichever way you make it, this coverlet, when completed, will be your pride and joy because it is sure to win many compliments.